Note: This article was written by Mark Janas, EdD and originally appeared on June 9, 2012 in the Sport Digest, published by the United States Sports Academy. It was updated in July 2017. 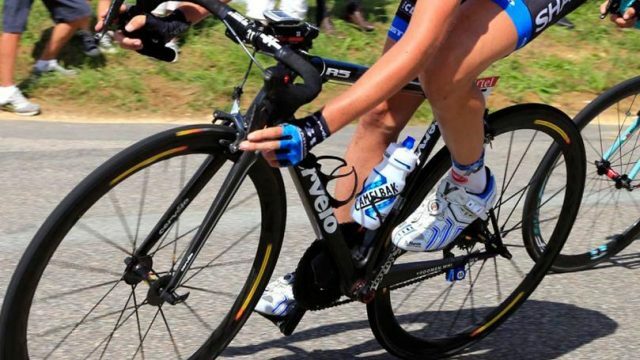 Professional cycling, one of the most popular sports in Europe and rich in history, has been plagued in recent years by suspicions of performance-enhancing drug use by many riders, positive drug tests, and even the dethroning of recent Tour de France winners, including cycling’s all-time great Lance Armstrong. But, the use of performance enhancing substances is certainly not new to cycling. In fact, the sport has had to face the issue for over a century, arguably longer than any other organized sport. Because of this dubious and lengthy history, cycling perhaps provides one of the best examples for analysis of doping in sports. Bicycle racing can trace its roots as far back as 1868 when Englishman James Moore won the first organized race in France. The first world championships were held in 1893, and cycling has been included in every Olympics since the modern movement in 1896. Prior to World War II, the only sport in the United States more popular than competitive cycling was baseball. Cyclists were among the highest paid athletes in the country, and thousands of spectators flocked to races. The most storied event in history, the Tour de France, first raced in 1903. Cycling’s stars are among the most famous athletes in Europe, and they make six figure salaries or more plus endorsements. As the popularity of competitive cycling has increased over the years, so has the influence of money and the pressure to win. That pressure has resulted in a long history of doping. Although details of the story are a bit unclear and disputed, world champion Arthur Linton is often cited as cycling’s first fatality related to drugs. Linton had just won the 1886 Bordeaux-to-Paris race in record-breaking time, but he died at age 24 as a result of an overdose of trmethyl, reportedly taken to help improve his performance. Another of Choppy’s champion riders, Jimmy Michael, on one instance appeared to be in a daze while racing, eventually riding around the track in the opposite direction of the other cyclists. He died at 28. Antics like these would eventually get Choppy banned from professional cycling, even though there were no specific rules against his practices at the time. By the 1940s a new drug was on the scene. Amphetamines had been developed for military use to combat fatigue and to help aircrews stay alert. The top Tour riders soon found amphetamines necessary to remain competitive. Even by the 1950s, there was no ban against performance enhancing drugs. Many believed that the Tours of the 1950s were won by riders on amphetamines. These suspicions were confirmed by five-time Tour winner Jacques Anquetil. He openly admitted to taking amphetamines, as well as his belief that he should be allowed to do what it takes to win. Although it was no secret that some cyclists lost their lives using strong stimulants during the previous decades, it was not until a Danish cyclist died in 1960 during the Olympic Games that the governing bodies responded. The use of performance-enhancing drugs was first made illegal on June 1, 1965 and shortly to follow were the dismissal of several riders from races that year. By 1966, the Tour began drug testing the riders. Anquetil, one of many riders opposed, said, “We find these tests degrading.” Anquetil lead a revolt by the cyclists that stopped the race the next day. The Tour conducted no further tests that year. Six riders did test positive as a result of those drug tests but were given only light sanctions. In 1967, the International Olympic Committee (IOC) created a medical commission to address the misuse of drugs in Olympic sports. Methods of detection were improved, but it seemed as though the users were able to stay a step ahead. The Tour of 1967 turned tragic when Tom Simpson, Britain’s “greatest cyclist,” died of heat exhaustion exacerbated by amphetamines. Amphetamines were found in his body post-mortem as well as in his luggage. Anabolic steroids were first used by the Soviet Union in the 1970s to encourage muscle growth in strength sports, but they had also found use among endurance athletes to accelerate recovery. By the 1980s and early 1990s these drugs had made their way into professional cycling. 1988 Tour leader Pedro Delgado tested positive for probenecid, a “masking drug” used to flush steroids from the body. The substance was not banned by cycling, even though it was by the IOC, and thus no sanctions were imposed. Delgado went on to win the race. Another rider tested positive for testosterone that year and received a time penalty. By the late 1980s, a new technique made its way to the peloton. Researchers had long been interested in how red cell mass affected exercise performance. As far back as 1947, studies suggested that boosting the haematocrit (the number of red blood cells as a percentage of total blood volume) to 55% (from the normal of around 40%) by transfusion made exercise at altitude easier by enabling the body to transport more oxygen. Erythropoietin (EPO) is a naturally occurring hormone that stimulates the bone marrow to produce red blood cells. A process soon became available to synthesize EPO from human urine at which point it is technically known as rEPO. However, too much EPO can push the haematocrit to dangerously high levels, causing the blood to clot. EPO use was suspected in nearly 20 deaths of European cyclists over a four-year period. Riders who were using rEPO could boost their haematocrit levels to over 60% in some cases. By the late 1990s, to address rEPO use, professional cycling set haematocrit limits at a somewhat arbitrary 50%, but this effectively encouraged cyclists to “dope up to the line” or to dilute their blood before a pre-race test. Although professional cycling maintained that it was clean, the use of rEPO, amphetamines, steroids, and human growth hormone remained common throughout the 1990s. Team agents were caught with banned substances. A few hotels were raided, and a few teams were disqualified. One rider was even caught dealing. A few riders came clean with what they used, how they got it, and how they eluded and cheated drug tests. By the time of the 2004 Sydney Olympics, a reliable test for rEPO had been developed. This forced riders to resume the more complex process of blood doping, whereby the cyclist’s own blood or that of a donor is transfused to raise the red blood cell count. Olympic champion Tyler Hamilton tested positive for donor blood after both the Olympics and the Vuelta time-trial. The IOC could not strip Hamilton of his gold medal, because his backup blood sample had been frozen, leaving too few red blood cells to analyze. However, the Vuelta sample cost Hamilton a two-year ban from the sport. Hamilton faced a lifetime ban from the sport after testing positive for a steroid in early 2009. Adding to the scandals of the mid 2000s was the cocaine overdose of superstar Marco Pantani in 2004, after which it was revealed that he raced using rEPO throughout his career. Even with all of the previous drama, the biggest scandals were yet to come. First, a Spanish investigation in May 2006 found evidence of a major doping operation in Madrid. Police seized steroids, hormones, rEPO, frozen blood, and laboratory equipment. In all, 58 riders were implicated. Five were arrested, and nine riders, including favorites Ivan Basso and Jan Ullrich, were ousted from the Tour. American Floyd Landis, who was not involved in the initial scandal, went on to make an amazing comeback to win the 2006 Tour. But he was later stripped of his title after it was revealed that he tested positive for testosterone from a sample taken during the Tour. Similarly, Alberto Contador had his 2010 Tour win vacated after being found guilty of doping. By the end of the 20th century the sport almost seemed numb from the scandals, suspicions and accusations. Armstrong, once deemed as a potential “clean” savior of the sport, also fell under suspicion. First, there was an incident where a trace amount of corticoids was found in Armstrong. It later turned out to have come from an externally-applied cream. Then reports came out about possible rEPO use by Armstrong and others on his U.S. Postal team. The Armstrong saga came to a head later in 2012. In October of that year, the Union Cycliste Internationale (UCI) upheld the USADA sanctions and Armstrong was stripped of all of his Tour de France titles. In just two short weeks following, sponsors Nike and RadioShack cut ties with him, as well as other sponsors including Anheuser-Busch, Trek Bicycle Corporation, Giro, Honey Stinger, SRAM, Oakley, and 24 Hour Fitness. In that same month, he was forced to resign as chairman of the Lance Armstrong Foundation (later renamed as “Livestrong.”) Adding insult to injury, in November 2012, Armstrong was elected as the top “Anti-Sportsman of the year” by Sports Illustrated, and in early in 2013, the International Olympic Committee removed Armstrong’s results from its record books and asked that he return his Bronze medal. Armstrong came clean completely during a January 2013 interview with Oprah Winfrey where he admitted to using performance-enhancing drugs for much of his career, including all seven Tour de France wins. Although he admitted the doping, Armstrong said he neither felt that it was wrong nor felt bad about what he was doing. The Armstrong revelations were of course damaging to the sport, but perhaps of greatest concern: The last several years have seen the withdrawal of many major sponsors due to the doping scandals. The sponsors who are staying in are drastically cutting their team budgets. Some teams are implementing their own testing standards that are much more stringent than those of the UCI. Other teams are requiring riders to sign contracts agreeing to pay back previous earnings, if they are found doping. Doping has been prevalent in competitive cycling for more than a century. The types of doping agents and techniques have changed over the years, and the sport’s governing bodies continue to struggle to address the issue. It could easily be argued that because doping has been part of the sport since its inception, it has become in fact part of the culture of cycling. Thus, ethical questions regarding doping in cycling may perhaps have different answers than in other sports. Either way, it is likely that the advent of new technologies such as genetic engineering will pose a new set of challenges, issues, and ethical questions for cycling and other sports. Dr. Mark Janas is the Managing Partner and CEO of In3 Inc., a technology and business development firm based in Raleigh, N.C. with holdings in sport-related businesses including RevoRace.com and ScoreTRAX.com. He received his doctorate in sports management from the United States Sports Academy.